How can 31 miles seem tougher than 112? West Old LaHonda… what else? Fog just teasing us, just the way we like it. Sunday’s big ride went easier than expected, although I’ll admit that riding to & from the shop yesterday had my legs feeling a bit less than lively. Kevin fared not quite so well; he hitched a ride (in his sister’s car) because his tail end was a bit raw. Some of that is because he’s a bit low on base miles this year, having skipped quite a few rides due to not feeling well, and part of it might be that he stays in his saddle on climbs, while for me, as soon as the road tilts up much, I’m standing on the pedals. What about this morning on Kings? I was OK for about a mile or so before Kevin, Kevin & Karen (an interesting acronym there?) rode away from me. It wasn’t my legs; it was my breathing. The legs felt pretty good. Once on top I felt OK, gradually recovering, and even pushed pretty hard on the descent into Sky Londa. In fact, without too much effort, it was my fastest descent on that section in over two years! Think I was excited about having dry pavement again. Karen peeled off to work at Sky Londa while the two Kevin’s and I continued to West Old LaHonda. Temps cooled down as we descended, for good reason it turned out- the edge of the fog was sitting right at the intersection of 84 & West Old LaHonda. In a way I was disappointed we didn’t have an overcast for the climb back up to Skyline, since the rabbits hide when the sun comes out. Nice view of the fog though. 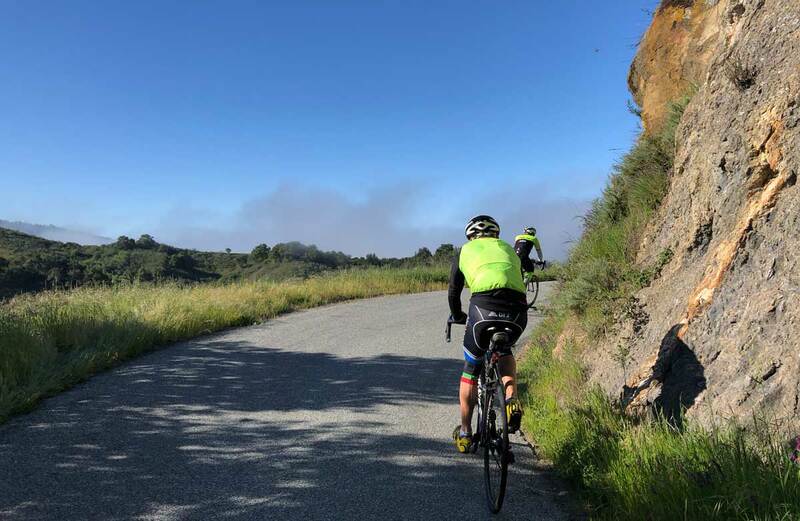 It was interesting to note that, after descending back into Woodside, we were actually riding slower up that little climb heading towards Tripp Road than we had on Sunday, when it came after 108 miles, not 28. Maybe it just takes me an insanely-long time to warm up.